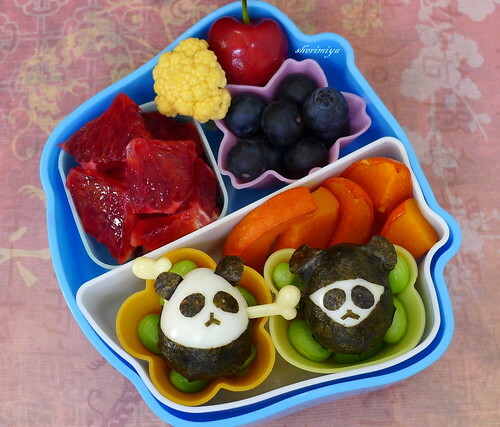 Kung Fu Panda vs. Ninja Panda Bento, originally uploaded by sherimiya ♥. Since my last panda bento on Monday, I got to wondering: who would win the ultimate panda martial arts showdown between Kung Fu Panda and Ninja Panda? Hmmm. Food for thought. We all know how sneaky and protective ninja can be, but don't underestimate the power of kung fu. Didn't you see the movie? There was only one way to test the theory. I'd have to make both, side by side, and let TinySprite determine their fate. 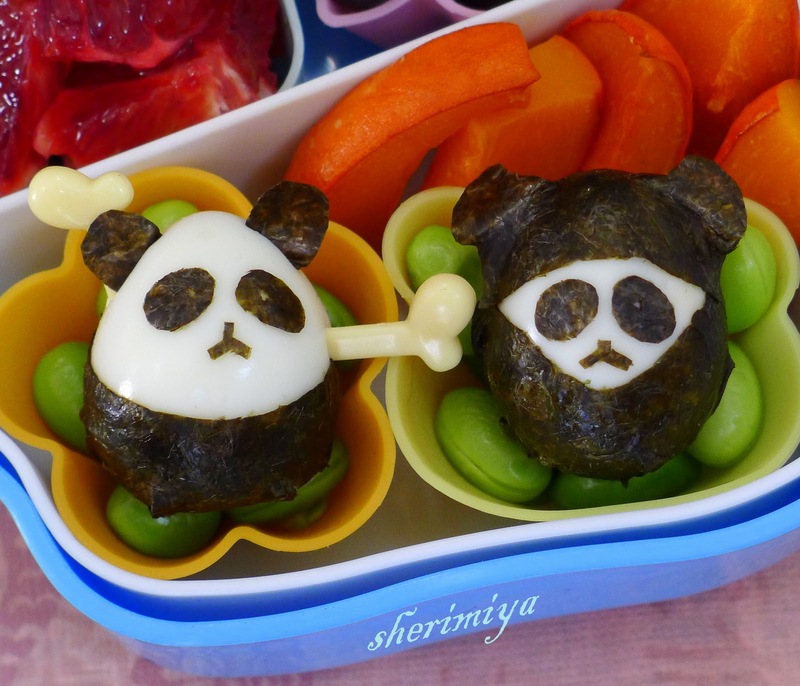 I put two nori-decorated quail egg pandas -- the ninja wearing stealth wear and the kung fu panda wearing loose pants to better unleash the power of his fists -- in their own edamame-lined cups. To keep it fair I excluded weaponry. The rest of the bento includes buttery kabocha slices, steamed yellow cauliflower, chopped blood oranges, blueberries and a cherry. I tried to get a shot of her decision, but it was instantaneous. She selected the ninja for first demise, quick and painless. She spent way more time playing with the Kung Fu panda's arms before demolishing him, and then demonstrated his moves in person. You may recall she's a white belt Kung Fu practitioner herself, so maybe this has something to do with her choice. This may not be the final word though. Next time: weapons! I love the panda theme its so cute! Thanks Regina, Chow and Chatter, mama elaine, Cosmetic Aficionado and Jenn~! Yay Kung Fu Panda! 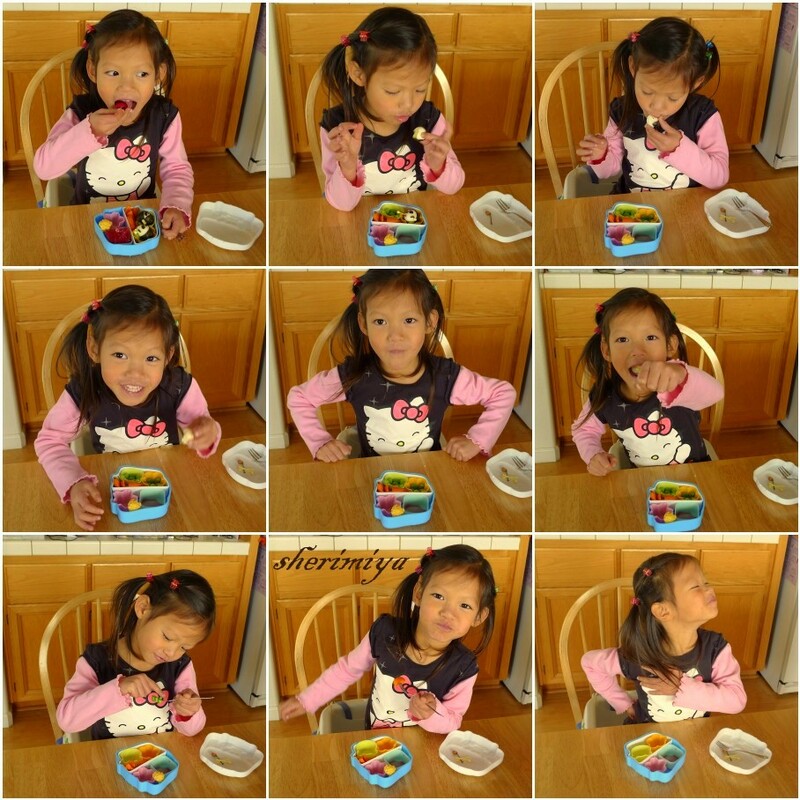 Fresh, funny and yummy! Love it! Fantastic! It would have been hard for me to choose between the two :D I can't wait for the rematch. TS is sooooo cute! :) panda is the magic word ^_^. This was a total win-win situation!!! So cute!! TS looks adorable on those pictures!!! (shall I mention I liked the shirt ;P?). Mommy is so cool to arrange this match :),I loved everything . HAI-YAH! There is no competition when Tiny Sprite is around. She is the winner, hands down! Ah.. I can see how this was made with tons of love.. Thanks Pipaw, tatabonita, Lia, natakiya, karaimame, Chantale, KFP and Linsey!